Riboflavin, or vitamin B-2, was initially isolated from milk and its origin can be traced to English chemist Alexander Wynter Blyth in 1872;  it was originally called lactochrome or lactoflavin. Riboflavin is important for energy production, enzyme function, and normal fatty acid and amino acid synthesis. In addition to producing energy for the body, riboflavin works as an antioxidant and is necessary for the reproduction of glutathione, a free radical scavenger. Additionally, it is essential for normal development, growth, reproduction, lactation, physical performance, and well-being. Riboflavin is water soluble and heat stable. Its chemical nomenclature is 7,8-dimethyl-10 (1'-D-ribityl) isoalloxazine. Riboflavin is not stored in large amounts; minute reserves are stored in the liver, kidneys, and heart. Riboflavin deficiency is usually associated with other vitamin B complex deficiencies; isolated riboflavin deficiency is rare. Riboflavin deficiency is generally considered to be uncommon in the United States because of fortification of many foods, including grains and cereals. Riboflavin deficiency can occur with a diet deficient in these riboflavin-rich foods. Additionally, glass milk containers promote degradation of the vitamin from exposure to light. Daily consumption of breakfast cereal and milk would be expected to provide an adequate intake of riboflavin. Most dietary riboflavin is ingested as food protein. In the stomach, gastric acidity cleaves most of the coenzyme forms of riboflavin (FAD and FMN) from the protein. The coenzymes are then hydrolyzed to riboflavin by pyrophosphatases and phosphatases in the upper intestine. Primary absorption of riboflavin occurs in the proximal small intestine via a rapid, active and saturable transport system. The rate of absorption is proportional to intake, and it increases when riboflavin is ingested along with other foods and in the presence of bile salts. A small amount of riboflavin circulates via the enterohepatic system. Malabsorption from conditions such as celiac disease, malignancies, and alcoholism can promote deficiency of riboflavin. Oral riboflavin doses of 1-4 mg daily are usually considered sufficient as a nutritional supplement in patients with normal GI absorption. These doses should be present in the normal diet. 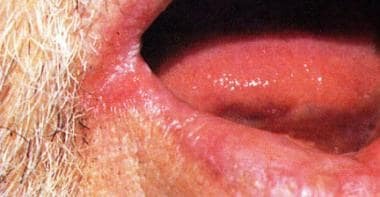 Riboflavin deficiency is often associated with cheilosis (chapping and fissuring of the lips). 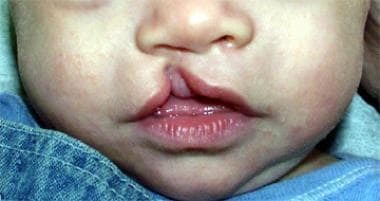 Riboflavin deficiency can be associated with various developmental abnormalities, including cleft lip. Measurement of red blood cell glutathione reductase activity may help in the detection of riboflavin deficiency. An increase in the stimulation of this enzymatic reaction confirms a low level of riboflavin. Riboflavin can cause false elevations of urinary catecholamines and false-positive urine urobilinogen reactions (Ehrlich test). Except in malabsorption syndromes, riboflavin is readily absorbed from the upper GI tract. The extent of GI absorption is increased when the drug is administered with food and is decreased in patients with hepatitis, cirrhosis, and biliary obstruction. The biologic half-life of riboflavin is about 66-84 minutes following oral or intramuscular administration of a single large dose in healthy individuals. Only about 9% of the drug is excreted unchanged. Excretion appears to involve renal tubular secretion as well as glomerular filtration. Amounts in excess of the body's needs are excreted in urine. As a photosynthesizing agent, riboflavin is destroyed by light. A combination of light, oxygen, and riboflavin can lead to formation of free radicals and, consequently, cataracts; patients with cataracts are advised to take no more than 10 mg of riboflavin daily. Northrop-Clewes CA1, Thurnham DI. The discovery and characterization of riboflavin. Ann Nutr Metab. 2012. 61(3):224-30. [Medline]. Powers HJ. Riboflavin (vitamin B-2) and health. Am J Clin Nutr. 2003 Jun. 77(6):1352-60. [Medline]. [Full Text]. Powers HJ, Corfe BM, Nakano E. Riboflavin in development and cell fate. Subcell Biochem. 2012. 56:229-45. [Medline]. McNulty H, Scott JM. Intake and status of folate and related B-vitamins: considerations and challenges in achieving optimal status. Br J Nutr. 2008 Jun. 99 Suppl 3:S48-54. [Medline]. Ma AG, Schouten EG, Zhang FZ, et al. Retinol and riboflavin supplementation decreases the prevalence of anemia in Chinese pregnant women taking iron and folic Acid supplements. J Nutr. 2008 Oct. 138(10):1946-50. [Medline]. Yazdanpanah N, Uitterlinden AG, Zillikens MC, et al. Low dietary riboflavin but not folate predicts increased fracture risk in postmenopausal women homozygous for the MTHFR 677 T allele. J Bone Miner Res. 2008 Jan. 23(1):86-94. [Medline]. Naghashpour M, Amani R, Nutr R, Nematpour S, Haghighizadeh MH. Riboflavin status and its association with serum hs-CRP levels among clinical nurses with depression. J Am Coll Nutr. 2011 Oct. 30(5):340-7. [Medline]. Nichols EK, Talley LE, Birungi N, et al. Suspected outbreak of riboflavin deficiency among populations reliant on food assistance: a case study of drought-stricken Karamoja, Uganda, 2009-2010. PLoS One. 2013. 8(5):e62976. [Medline]. [Full Text]. Whitfield KC, Karakochuk CD, Liu Y, et al. Poor thiamin and riboflavin status is common among women of childbearing age in rural and urban Cambodia. J Nutr. 2015 Mar. 145(3):628-33. [Medline]. Choi JY, Kim YN, Cho YO. Evaluation of riboflavin intakes and status of 20-64-year-old adults in South Korea. Nutrients. 2014 Dec 31. 7(1):253-64. [Medline]. Gunanti IR, Marks GC, Al-Mamun A, Long KZ. Low serum vitamin B-12 and folate concentrations and low thiamin and riboflavin intakes are inversely associated with greater adiposity in Mexican American children. J Nutr. 2014 Dec. 144(12):2027-33. [Medline]. Merrill AH Jr, Lambeth JD, Edmondson DE, McCormick DB. Formation and mode of action of flavoproteins. Annu Rev Nutr. 1981. 1:281-317. [Medline]. McCormick DB. Riboflavin. Shils ME, Olson JE, Shike M, eds. Modern Nutrition in Health and Disease. Lea & Febiger; 1994. 366–75. Moriyama Y. Riboflavin transporter is finally identified. J Biochem. 2011 Oct. 150(4):341-3. [Medline]. Menezes MP, Farrar MA, Webster R, et al. Pathophysiology of motor dysfunction in a childhood motor neuron disease caused by mutations in the riboflavin transporter. Clin Neurophysiol. 2016 Jan. 127(1):911-8. [Medline]. Manole A, Houlden H, Pagon RA, et al. Riboflavin Transporter Deficiency Neuronopathy. 1993. [Medline]. [Full Text]. Robitaille J, Carmichael SL, Shaw GM, Olney RS, National Birth Defects Prevention Study. Maternal nutrient intake and risks for transverse and longitudinal limb deficiencies: data from the National Birth Defects Prevention Study, 1997-2003. Birth Defects Res A Clin Mol Teratol. 2009 Sep. 85(9):773-9. [Medline]. Smedts HP, Rakhshandehroo M, Verkleij-Hagoort AC, et al. Maternal intake of fat, riboflavin and nicotinamide and the risk of having offspring with congenital heart defects. Eur J Nutr. 2008 Oct. 47(7):357-65. [Medline]. Hoey L, McNulty H, Strain JJ. Studies of biomarker responses to intervention with riboflavin: a systematic review. Am J Clin Nutr. 2009 Jun. 89(6):1960S-1980S. [Medline]. Russell, RM. Vitamin and trace mineral deficiency and excess. Kasper DL, Braunwald E, Fauci AS, et al, eds. Harrison's Principles of Internal Medicine. 16th ed. New York, NY: McGraw-Hill; 2005. 403-11. Schoenen J, Lenaerts M, Bastings E. High-dose riboflavin as a prophylactic treatment of migraine: results of an open pilot study. Cephalalgia. 1994 Oct. 14(5):328-9. [Medline].